Most of the mistakes during DNA replication are promptly corrected by the proofreading ability of DNA polymerase itself. ((Figure)). In proofreading, the DNA pol reads the newly added base before adding the next one, so a correction can be made. The polymerase checks whether the newly added base has paired correctly with the base in the template strand. If it is the right base, the next nucleotide is added. If an incorrect base has been added, the enzyme makes a cut at the phosphodiester bond and releases the wrong nucleotide. This is performed by the 3′ exonuclease action of DNA pol. Once the incorrect nucleotide has been removed, it can be replaced by the correct one. Some errors are not corrected during replication, but are instead corrected after replication is completed; this type of repair is known as mismatch repair ((Figure)). Specific repair enzymes recognize the mispaired nucleotide and excise part of the strand that contains it; the excised region is then resynthesized. If the mismatch remains uncorrected, it may lead to more permanent damage when the mismatched DNA is replicated. How do mismatch repair enzymes recognize which of the two bases is the incorrect one? In E. coli, after replication, the nitrogenous base adenine acquires a methyl group; the parental DNA strand will have methyl groups, whereas the newly synthesized strand lacks them. Thus, DNA polymerase is able to remove the wrongly incorporated bases from the newly synthesized, non-methylated strand. In eukaryotes, the mechanism is not very well understood, but it is believed to involve recognition of unsealed nicks in the new strand, as well as a short-term continuing association of some of the replication proteins with the new daughter strand after replication has completed. Another type of repair mechanism, nucleotide excision repair, is similar to mismatch repair, except that it is used to remove damaged bases rather than mismatched ones. The repair enzymes replace abnormal bases by making a cut on both the 3′ and 5′ ends of the damaged base ((Figure)). The segment of DNA is removed and replaced with the correctly paired nucleotides by the action of DNA pol. Once the bases are filled in, the remaining gap is sealed with a phosphodiester linkage catalyzed by DNA ligase. This repair mechanism is often employed when UV exposure causes the formation of pyrimidine dimers. Nucleotide excision repairs thymine dimers. When exposed to UV light, thymines lying adjacent to each other can form thymine dimers. In normal cells, they are excised and replaced. 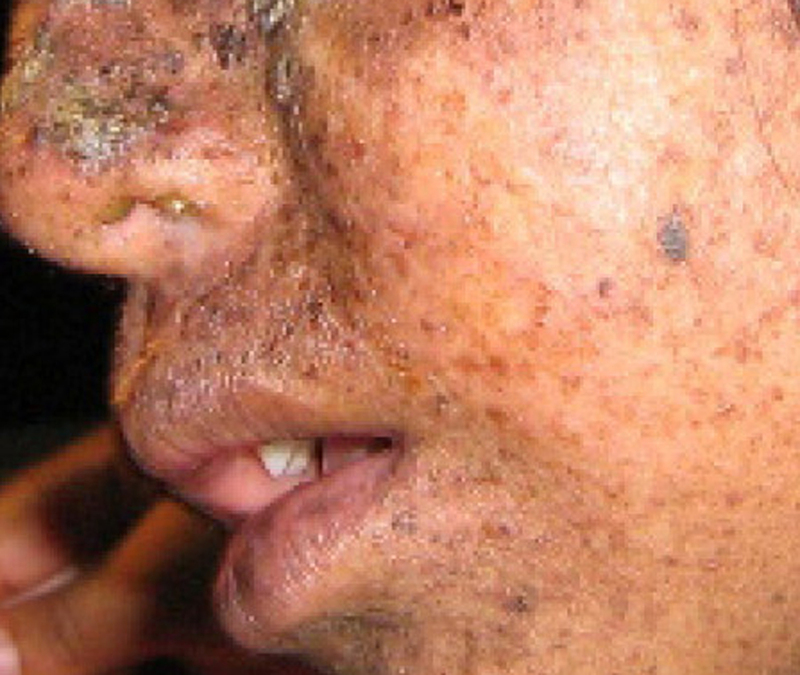 A well-studied example of mistakes not being corrected is seen in people suffering from xeroderma pigmentosa ((Figure)). Affected individuals have skin that is highly sensitive to UV rays from the sun. When individuals are exposed to UV light, pyrimidine dimers, especially those of thymine, are formed; people with xeroderma pigmentosa are not able to repair the damage. These are not repaired because of a defect in the nucleotide excision repair enzymes, whereas in normal individuals, the thymine dimers are excised and the defect is corrected. The thymine dimers distort the structure of the DNA double helix, and this may cause problems during DNA replication. People with xeroderma pigmentosa may have a higher risk of contracting skin cancer than those who don’t have the condition. Mutations may have a wide range of effects. Point mutations are those mutations that affect a single base pair. The most common nucleotide mutations are substitutions, in which one base is replaced by another. These substitutions can be of two types, either transitions or transversions. Transition substitution refers to a purine or pyrimidine being replaced by a base of the same kind; for example, a purine such as adenine may be replaced by the purine guanine. Transversion substitution refers to a purine being replaced by a pyrimidine, or vice versa; for example, cytosine, a pyrimidine, is replaced by adenine, a purine. Some point mutations are not expressed; these are known as silent mutations. Silent mutations are usually due to a substitution in the third base of a codon, which often represents the same amino acid as the original codon. Other point mutations can result in the replacement of one amino acid by another, which may alter the function of the protein. Point mutations that generate a stop codon can terminate a protein early. Some mutations can result in an increased number of copies of the same codon. These are called trinucleotide repeat expansions and result in repeated regions of the same amino acid. Mutations can also be the result of the addition of a base, known as an insertion, or the removal of a base, also known as deletion. 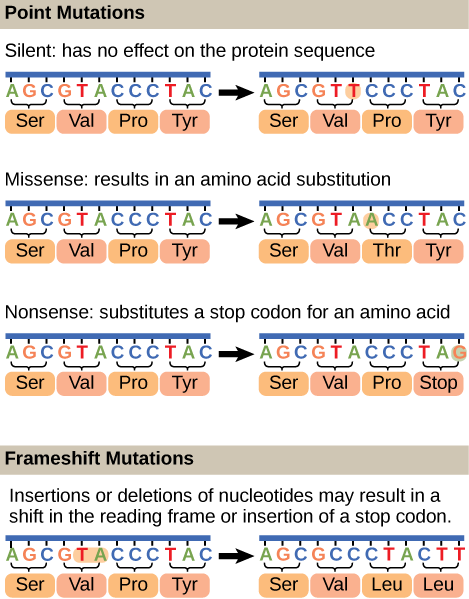 If an insertion or deletion results in the alteration of the translational reading frame (a frameshift mutation), the resultant protein is usually nonfunctional. Sometimes a piece of DNA from one chromosome may get translocated to another chromosome or to another region of the same chromosome; this is also known as translocation. These mutation types are shown in (Figure). DNA polymerase can make mistakes while adding nucleotides. It edits the DNA by proofreading every newly added base. Incorrect bases are removed and replaced by the correct base before proceeding with elongation. Most mistakes are corrected during replication, although when this does not happen, the mismatch repair mechanism is employed. Mismatch repair enzymes recognize the wrongly incorporated base and excise it from the DNA, replacing it with the correct base. In yet another type of repair, nucleotide excision repair,	a damaged base is removed along with a few bases on the 5′ and 3′ end, and these are replaced by copying the template with the help of DNA polymerase. The ends of the newly synthesized fragment are attached to the rest of the DNA using DNA ligase, which creates a phosphodiester bond. Most mistakes are corrected, and if they are not, they may result in a mutation, defined as a permanent change in the DNA sequence. Mutations can be of many types, such as substitution, deletion, insertion, and trinucleotide repeat expansions. Mutations in repair genes may lead to serious consequences such as cancer. Mutations can be induced or may occur spontaneously. 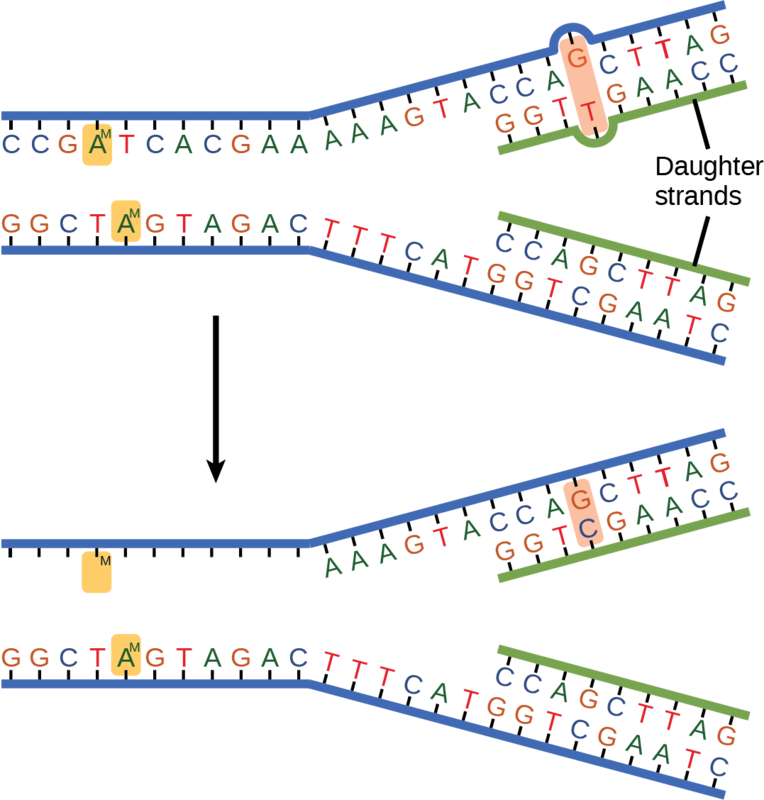 (Figure) A frameshift mutation that results in the insertion of three nucleotides is often less deleterious than a mutation that results in the insertion of one nucleotide. Why? 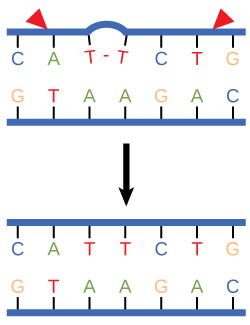 (Figure) If three nucleotides are added, one additional amino acid will be incorporated into the protein chain, but the reading frame wont shift. A scientist creates fruit fly larvae with a mutation that eliminates the exonuclease function of DNA pol III. Which prediction about the mutational load in the adult fruit flies is most likely to be correct? The adults with the DNA pol III mutation will have significantly more mutations than average. The adults with the DNA pol III mutation will have slightly more mutations than average. The adults with the DNA pol III mutation will have the same number of mutations as average. The adults with the DNA pol III mutation will have fewer mutations than average. An adult with a history of tanning has his genome sequenced. The beginning of a protein-coding region of his DNA reads ATGGGGATATGGCAT. If the protein-coding region of a healthy adult reads ATGGGGATATGAGCAT, identify the site and type of mutation. This is a frameshift mutation with a deletion of an “A” in the 12th position of the coding region. DNA Repair by OpenStax Biology 2nd Edition is licensed under a Creative Commons Attribution 4.0 International License, except where otherwise noted.